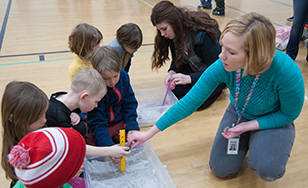 St. Scholastica students work with children at Lowell Elementary on STEM-related projects. Faculty members at St. Scholastica are reaching out to help Duluth elementary and middle school math educators improve their teaching tactics and results in the classroom. The new initiative is the latest in a series of efforts by St. Scholastica faculty to strengthen teaching in Science, Technology, Engineering and Math (STEM). St. Scholastica's School of Science has received a $45,240 grant from the Minnesota Office of Higher Education. The funds will be used for the 2017-18 Improving Teacher Quality Program project called "Engage, Learn, and Connect Math Topics Course." The project will engage Duluth-area elementary and middle school mathematics teachers in high-quality learning and reflection that will improve their teaching skills and capacity. Kirk and her St. Scholastica mathematics department colleagues Guanshen Ren and Luther Qson will conduct the workshops. Participating teachers will receive a stipend and a device - either a Chromebook or an iPad - to utilize high-tech teaching methods in the classroom. This initiative fits with the Duluth Public Schools' current efforts to create Professional Learning Communities within each academic subject area, Kirk said. PLCs create a cohesive structure for cumulative instruction that builds year by year, improving and streamlining the student experience. "Having that continuity between the grades can be quite empowering," Kirk said, "instead of having each teacher working independently. PLCs have the potential for very strong gains." Engaging students in STEM fields at an early age is vital to their future success in the subject matter, she said. "If we lose them in the middle and elementary school years, trying to regain them in STEM when they get to high school is very difficult," she said. "It's really critical that we focus energy directly on students, and teachers as well." Kirk added that having strong partners in the initiative, such as Lincoln Middle School Principal Brenda Vatthauer, has been instrumental. St. Scholastica is also involved in a series of other efforts aimed at fortifying STEM education. This is a key issue in Minnesota and beyond, as school districts across the country are facing a shortage of STEM educators. -Last summer, Kirk created a STEM summer program for local middle school students, using a $15,000 grant from the Lloyd K. Johnson Foundation.